At For the Love of Cake, we’re not just bakers, we’re also designers. 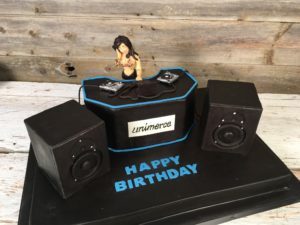 We pride ourselves on taking special care and attention to detail with all of our cakes and custom designs, but often our customers don’t get to meet the designers behind their cakes. So who are these crafty confection creators of ours? To get to know our in-house artists, we start with co-founder Genevieve Finley and asked her a few questions about running a bakery. How did For the Love of Cake come to be? Genevieve Finley: I started in a loft workspace in June 2009 with a really simple website and I was making cakes by myself. In October, I signed the lease for our spot in Liberty Village, and by January 2010 we had opened our doors! It was really such a quick turnaround; a bit of a whirlwind, that first year. What were you doing before the bakery? GF: I worked at a bridal boutique, even doing some modelling here and there. Then, after Hurricane Katrina, I ran a non-profit for about two years. Coming back to Toronto, I was searching for my next career when I found a cake design class. I really had no intention of making it into a career, I just thought “Hey, that could be an interesting hobby, who knows?”, and look where we are today. GF: I have no formal design training, aside from the couple of cake design classes. I was thrown into design while at the bridal boutique and always had a creative side, so cake designing came to me pretty naturally. What do you love creating most? GF: I most love working on custom cakes with ideas that are completely from scratch, without a base photo or anything. I really enjoy taking a vision and making it a reality. What is the most common cake or theme people request from you? GF: Tiffany Box cakes, everybody asks for those. Which is your favourite cake that you’ve created? GF: On my own in that first year, I created a cake for Dina Pugliese of Breakfast Television. It had a purse, a magazine, makeup… I was really happy with the way that one turned out. The Rogers Center cake was my favourite as far as collaborative efforts go. We pulled some late nights, but it was such a big accomplishment. I mean, we made a seven foot CN Tower! What’s an interesting fact most people wouldn’t know about cake building? GF: Something interesting to me is that when you cover a cake with buttercream and fondant it actually acts as a sealant, and keeps the cake fresher for much longer. What is the weirdest request you’ve had to build? GF: Once, I was asked to make a cake which resembled a bed with a woman sleeping in it, then a naked man posed on top of her in a Captain Morgan stance, with his foot on her head. It was an unusual request. Other than cake, what is one of your favourite foods? What else do you love to do (aside from making cakes of course)? GF: I like spending time with my daughter. She’s two. I don’t have a lot of time for anything else really! What do you find to be the hardest aspect or technique when it comes to cake design? GF: To me, it’s replicating specific characters. When they’re really well-known, it’s so easy for someone else to spot mistakes. Got a special occasion that needs a special touch? Contact us for your wonderful, wild or weird requests.